Many terms used interchangeably do not necessarily mean the same thing. Such is the case with mouth splints and mouth guards. The difference between a mouth splint and a mouth guard can be seen in their names: A guard protects you, so mouth guards protect your teeth, while a splint holds two parts together to prevent unwanted or harmful movement, and that's exactly what dental splints do. A mouth splint is constructed by dentists or dental laboratory technicians from hard dental acrylic. 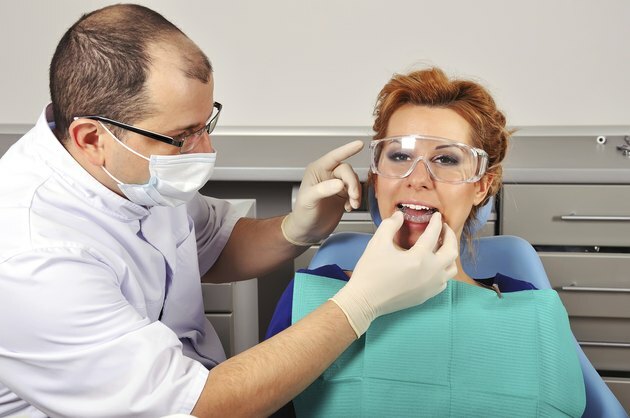 The dentist can either construct splints chair side or take an impression of your mouth that he sends to the dental laboratory for processing. There are several applications of splints in dentistry but the most popular one is when he constructs a splint to restrict the harmful effects of grinding, or bruxism. Mouth guards protect your mouth from harmful impact. You don't need to visit a dentist to get a mouth guard since they can be purchased over the counter, but if for any reason you need a close-fitting, custom-made mouth guard, it will have to be produced either by a dentist or made at a laboratory after the dentist takes an impression of your mouth. Mouth splints are used for several purposes in dentistry. Of these, the most popular is in stress management. When you are stressed, you tend to unknowingly take it out on your teeth. You clench your cheek muscles and grind your teeth. This places your jaw joints under immense pressure and you could end up damaging your teeth and jaw joints. To reverse this, the dentist places a splint between your upper and lower teeth to discourage grinding. Mouth guards are built to protect your teeth from harmful blows during exercise and contact sports. They are most popular with boxers, though some other professional, recreational and competitive athletes also wear mouth guards. However, when mouth guards are expected to be worn, there is not 100 percent compliance, according to the April 2002 "Journal of Athletic Training," which reported that only 63 percent of college athletes playing ice hockey consistently wore mouth guards, despite regulations requiring them to be worn.